The Crownline 320LS is ideal for daytripping or a comfortable overnight stay. Simple things mean a lot on the 320LS like the split-windscreen locking latch and aft sunpad. Sydneysiders are truly blessed when it comes to water. Hang on, let me rephrase that — navigable waterways. To the north is Brisbane Waters, the Hawkesbury River and Pittwater. Then there’s Port Jackson with its myriad of tributaries, Botany Bay and the Georges River and Port Hacking to the south. We live in a boating Nirvana and the number of boat registrations show we are getting out there and using them. Readers often ask me “what boat should I buy?” and my reply is always “how do you intend to use the boat?” or more importantly, “what water-borne activity will you spend most of your time doing?” In my case it’s fishing, so boat choice is fairly straightforward, but many others are getting into the laid back lifestyle that Sydney offers and spend their time cruising the harbour or anchored in one of the numerous secluded bays for a picnic lunch. But there is another side to boating that’s becoming more and more popular around here and that’s taking your boat to lunch. There are almost 50 restaurants and eateries in Sydney that can be accessed by water and following a recent boat test out on the harbour, the team did just that. We parked the boat at the NSW Maritime Marina at Rozelle Bay and dined in relaxed surroundings at Liquidity Restaurant. The food and service were excellent and the water views certainly took the edge off after we battled squally conditions out on the water. More on that later. But what also made the day more memorable was the boat we tested — the Crownline 320 LS bowrider. American-built Crownline boats are relative newcomers to the Aussie market. I first saw these boats at the 2004 Sydney International Boat Show and was truly impressed by their features, build quality and exceptional value for money. And the Crownline 320 LS continues in this vein. After spending a morning cruising a wind-blown harbour on this luxurious vessel I have formed a strong opinion. 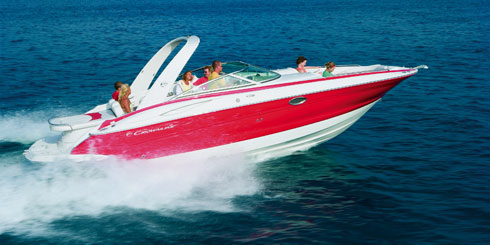 The Crownline 320LS is one of the best value-for-money dayboats I have come across. I called the 320LS a dayboat and that’s a bit of a misleading statement, because she has a separate head and shower, a microwave oven, cockpit refrigerator and two people can sleep onboard overnight in the amidships double cabin. Admittedly the cabin’s a bit squeezy, but it really is comfortable and well ventilated. The amidships cabin is the only area on this boat that I would call a wee bit squeezy, because her open-plan layout is designed to ensure she can fill the role of ‘entertainer’. The heavily padded bowrider cockpit is huge and can easily seat four adults in comfort. There’s even a removable dining table. But wait, there’s more… the piece de resistance of this Crownline is that she does have a large anchor locker, a bowsprit designed to hold a plough anchor and a windlass takes the hard work out of weighing anchor. From a driver’s perspective the helm station’s a treat. Bolster double seat, foot rest, full instrumentation that’s clearly visible from all angles and a windscreen that completely protects the driver when seated but also directs the airflow up and over their heads when driving while standing. Crownline’s build quality is second to none and the layout and list of standard features this boat builder offers are exceptional. But what’s really exceptional is the price tag. This massive 32ft bowrider can be yours for only $175,420 fitted with twin 5lt MPI MerCruiser V8s driving through Bravo I legs. Other options included the superb MerCruiser Digital throttle and Shift control and an electric anchor winch, which bump the price to $198,700. The test boat was fitted with twin 350 MerCruiser 5.7lt V8 ‘Seacore’ (MerCruiser’s latest corrosion-protected engine) sterndrives that easily punched this boat to 40mph into a strong headwind, which isn’t bad considering this boat was literally ‘straight out of the box’. In the performance stakes this boat is no Grand Prix winner, but I normally don’t travel around at more than 40mph during a day’s cruising and once these motors have a few hours on them her top speed will increase. During this test we were plagued by 35-knot squalling winds and the 320 revelled in the conditions. Her aggressive down-turned chines kept all spray outside the boat at speed and it was only head-on into the sea at slow speed that I did cop a face-full of spray. Trim tabs coped with any lateral trim problems caused by the strong wind across the bow. The way that this hull/motor combination handled the atrocious conditions on the harbour left me with no doubt that I could run the Crownline 320LS offshore with complete confidence. I wonder if they’ll lend me the boat again for a weekend cruise up to the Hawkesbury ? If you’re in the market for a top-quality luxury bowrider, and this is one of the biggest on the market, have a closer look at the Crownline 320LS. I am sure, like me, you’ll be blown away — even without the 35-knot winds. Straight out of the box the 320 hit at top speed of 40mph, which will improve after the new engines free up.